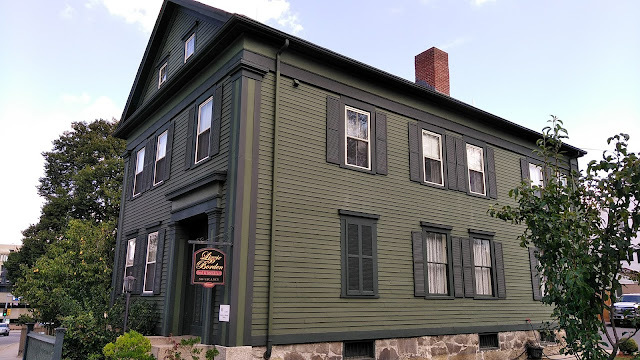 On the way back from our Salem road trip (you can read part 1 & 2), and the Edward Gorey House, Andrew and I stopped in Fall River, MA to see the Lizzie Borden Museum Bed and Breakfast. We weren't sure if this was going to be a stop along the way home, seeing as their last tour of the day is at 3pm, but we got there with even a little time to spare! I'll admit the location is a little odd, it's across from a big giant beautiful Catholic Church, but other than that, the neighbourhood seems a little sketchy. We took a walk around the block because we had some time to kill (ba-dum-ching) and there were people screaming at each other swearing on the sidewalk, so we made our walk back to the house pretty quick. The The Lizzie Borden House is big and imposing and there's a tiny parking lot in the back with a barn, to the side you'll find an enclosed ring of bushes and benches you can wait on, and a smaller building where you can purchase on-the-hour-tour tickets and kitschy Lizzie memorabilia. We purchased tickets for the last tour of the day with a tour guide named Jack. The workers are very knowledgeable and seem invested in the building and Lizzie's plight as a strong woman being stifled by her mean and detestable father and his new wife. 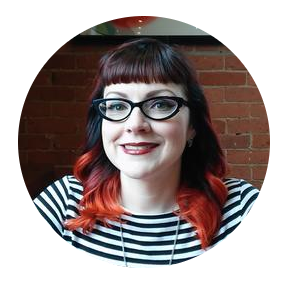 The guides try to give you background of her time and what she may have gone through. I noticed Jack even has a neck tattoo of an ax with the name Lizzie under it, so you know that's dedication! 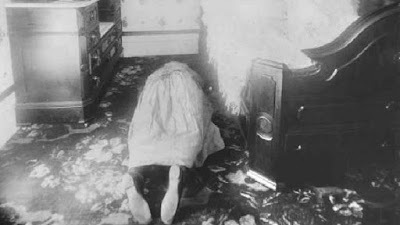 Now the story is a lot of speculation and nothing was ever proven, Lizzie was acquitted, but the little evidence found leads to her killing her father and step mother via ax. Did she do it? I feel like she did. 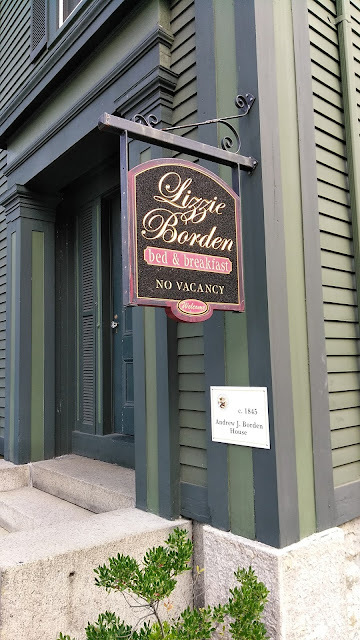 Some of my friends that I have told about the Lizzie Borden House, asked me if it was creepy and if I had any "encounters". I didn't, BUT there was an overwhelming feeling of sadness and frustration that I felt on Lizzie's behalf. It's hard to explain, I felt angry for her. 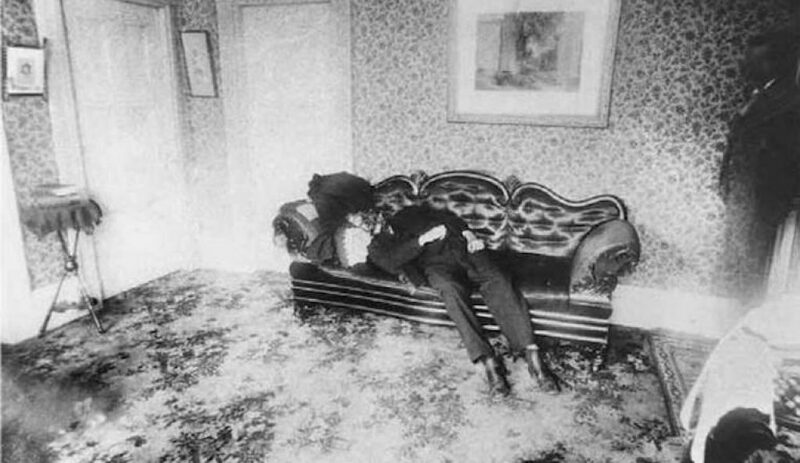 Crime scene photo of Andrew Borden. Crime scene photo of Abby Borden. The house has been functioning as a Bed and Breakfast since 1996. The whole house is decorated as it would have been during Lizzie's time and you can stay over night in one of eight Victorian styled bedrooms, including the one they found the body of her step mother in. They also offer a warm breakfast reminiscent of what would have been served the morning of the murders. Personally, I wouldn't stay overnight ~ not because I'm afraid of ghosts, but because I feel it's disrespectful. I think the spirits need to rest. Her story was sensationalized across the world and everyday it's repeated at her house. What you don't hear is about her philanthropy, which I think is much more important. 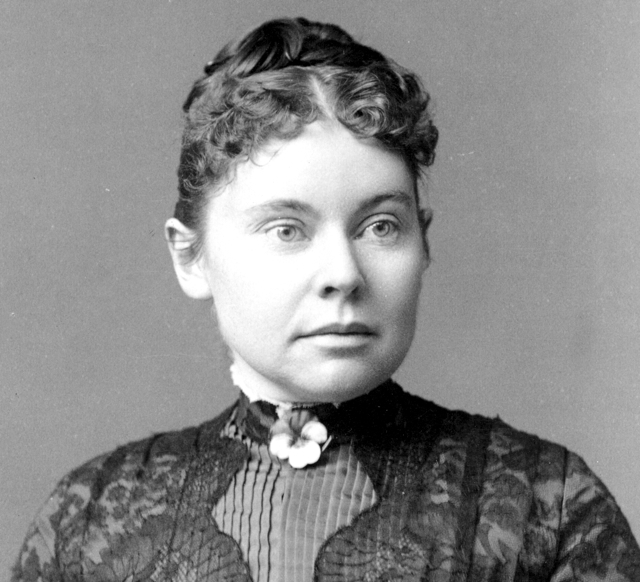 Once she inherited money from the case, she donated it to the local animal shelter, and the tour guide mentioned that she created scholarships for minorities to attend college. 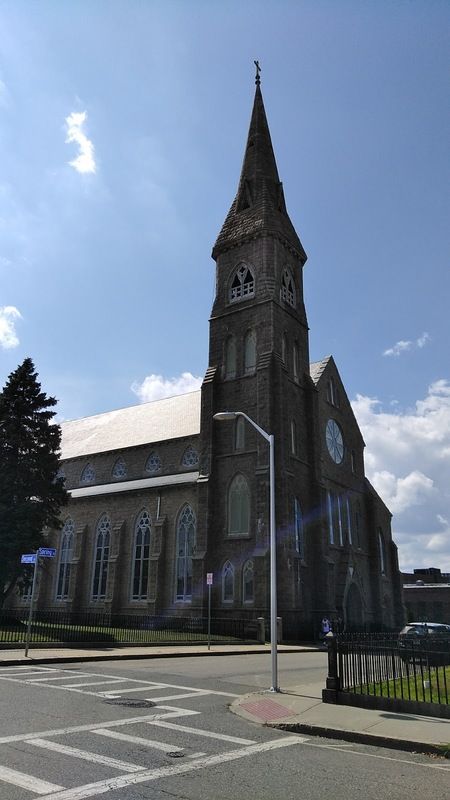 In her will from 1926 she wrote, "To the Animal Rescue League of said Fall River the sum of thirty thousand dollars, also my shares of stock in the Stevens Manufacturing Company. I have been fond of animals and their need is great and there are so few who care for them." It is said that the animal shelter is still getting funds from that trust! Not $30,000, but more like $5,000 a year. That's still pretty good! 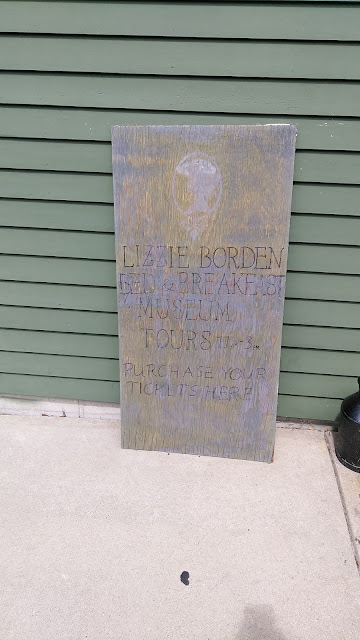 Side note, Lizzie had three Boston terriers and a cat named Blackie and her photo hangs proudly in the animal shelter to this day. 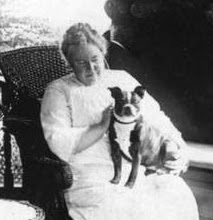 Lizzie and one of her terriers. I had forgotten about her charitable works. Thank you for reminding me! The whole situation was awful and I feel the house holds that sadness and despair. Still, glad you got to see it!